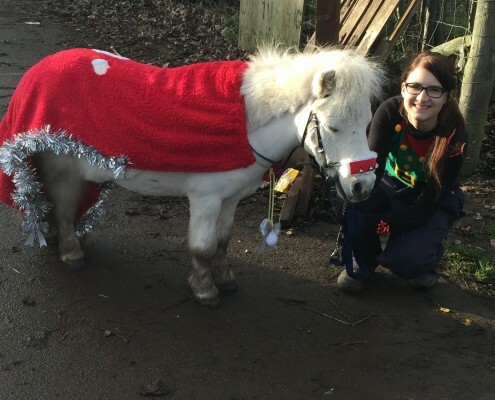 Members of Reaseheath’s Hoofstock Society spread Christmas spirit by making festive outfits for some of the college’s paddock animals, then taking them for a charity walk round campus. The students, three ponies and two donkeys visited departments across the college to collect donations for two favourite charities, The Donkey Sanctuary and the Horse and Pony Protection Association (HAPPA). The team, who had also made Christmas cookies, raised a total of £84. Keeper Kerri Robson, who launched the Hoofstock Society, said: “Our walk round college has become a tradition and this year the members have made a big effort to make it bigger and better. It’s a really nice way to spread some cheer and get the animals and students involved”.